Bright apartment on the fourth floor of a building in the historic center of Turin, in the area called Roman Quarter, streets and squares of the old charm. The site features pretty local daytime and evening, restaurants, cafés and curious shops, is just a few steps from Via Garibaldi, the bustling pedestrian shopping street; Piazza Castello, the Egyptian Museum, the MAO, the Duomo, Palazzo Reale, Palazzo Madama and the main sites of historical and cultural city. The apartment is close to the subway, to the Porta Susa station, the bus arriving from airports and stations of bike sharing. It is ideal for couples or families, opens onto a living room with a large modern kitchen equipped with all accessories and a door that opens onto a sunny balcony; two large rooms, one used as a living room with a sofa that converts into a comfortable double bed, a large bedroom and an elegant marble bathroom with shower. Guests will have a new apartment, comfortable, equipped with all accessories: dishwasher, fridge, oven, microwave, Nespresso, washing machine, dryer, toaster, kettle, TV LED 40 '', wi-fi high speed internet . To ensure the safety of the building has a concierge service all day. All guests will be provided sheets and towels. Four-room apartment, recently refurbished, located on the fourth floor of the city called Quadrilatero Romano, between the old streets and fascinating squares. Charming restaurant, cafés and shops characterize this place, which is very close to via Garibaldi, one of the most lively pedestrian shopping streets of Turin; to Piazza Castello, Egyptian Museum, Royal Palace, Madama Palace, Cathedral of St. John the Baptist, MAO and all the major historical and cultural sites. Porta Susa railway station as well, it is excellently connected to the rest of the city. Perfect for couples or families, the flat is composed by a living room two-bed room: the first one with a double bed, the second one, with a comfortable double bed - orthopedic mattress -, can be used as a living room or as a sleeping room , both rooms equipped with big closets; an elegant marble bathroom with hydro-massage shower. In the apartment you will find a dishwasher, traditional and microwave ovens, toaster, kettle, Nespresso, washing machine, iron, hairdryer, LED TV, wi-fi. A house with a full-time concierge service from monday to friday. Last but not least, all guests will receive clean sheets and towels. The location of this apartment is great. Lots of restaurants, shopping, a great open air market is a 5 min walk with inexpensive and good produce. 15-20 minute walk to Porta Sussa to catch trains and busses. The apartment is spacious. The photos on the VRBO site are accurate in our experience. We rented it for a month while in Torino. Family with one 10 year old daughter. The host was helpful and easy to work with. We used the apartment during the Lucifer heatwave and like most apartments in Torino it is not air conditioned. We got two fans and that helped. We left the fans in the apartment. This section of Torino can be quite noisy at night and that took getting use to for us. Like many apartments in Europe that are listed on VRBO as having two bedrooms, there is actually one bed room and a living room. The living room has a sofa couch used as a bed at night. The dining area is in the space between the kitchen and the living room/second bedroom. When it is hot outside, you need to keep the windows and roll up shutters closed during to day to keep out the heat and the apartment is rather dark inside. But at night you need to open the windows to get some cool air circulating in the apartment and the night time noise comes in as well. I think this is an issue common to most VRBO rented apartments in central Torino. The temperature control on the shower needs some work. We found it nearly impossible to set the water temperature to a stable and comfortable range between too hot and too cold. Overall, though it was a positive place to stay and we would recommend it. If you would like the feel to live as a local in central Turin this is it. Wonderful apartment, has everything you need. Warm welcome by Luca. At walkng distance to almost all the sights. Restaurants nearby mostly visited by locals only. Great experience! Excellent location for aperitivo, restaurants and shopping. Grand building. Very modern appartment. Very very clean. Spacious rooms, lovely balcony, huge modern bathroom very new looking kitchen. Owner gave great recs of where to go. Very quick wifi. El apartamento está muy bien situado, a una distancia a pie de los lugares más interesantes de Turín. El único problema es que son dos habitaciones, grandes y luminosas, pero una de ellas tiene que hacer al mismo tiempo de salón (o sea que hay que plegar el sofá-cama para poder sentarse), cosa queyo no vi en las fotografías. Aparte de esto, un lugar excelente. Appartamento molto centrale, zona perfetta per raggiungere i più importanti luoghi di interesse. Grande, spazioso, cucina ben accessoriata. Luca il proprietario è molto gentile e ci ha permesso di lasciare i bagagli in appartamento l'ultimo giorno fino alla sera. Consigliatissimo! 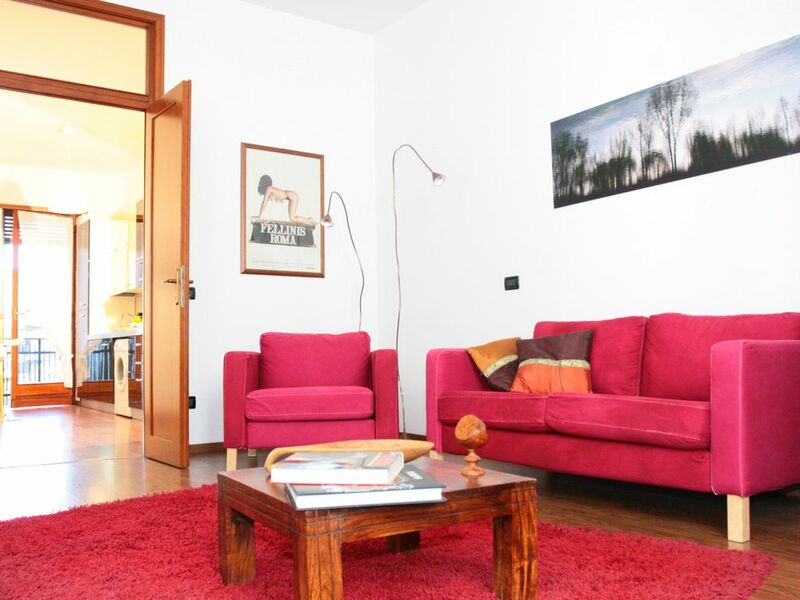 Apartment located in the mansion in the historic center of Turin near the main places of cultural interest, the Porta Susa station, metro, bus and bike sharing. Modern, bright and equipped with every comfort. Ideal for couples and families.